U.S. cover of the game. 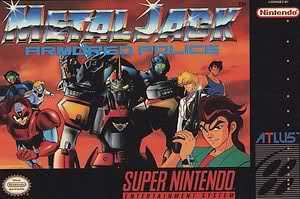 Metal Jack: Armored Police is a 1992 Japan-only beat 'em up Super Famicom game published by Atlus and based on the 1991 anime of the same name. There were plans to bring the game to North America and it was scheduled for release in December 1992, but it got cancelled in the end for unknown reasons. However, a prototype of the game was found by Jason Wilson (aka DreamTR) on an unknown date. The game was then sold to and dumped by The ISO Zone user ruiner9 in 2012. Gameplay footage of the game. SNES Central article, including a download for the game.